As this chapter of your life comes to a close, I look back on your many achievements with admiration and pride. You have worked so hard to reach this point of graduation, and although there is more work yet to come, I know that this is only the beginning your success. A graduation is both a beginning and an end–the conclusion of one stage of life and the start of another. Great things lie ahead of you and your potential is boundless–I can’t wait to see all that you accomplish. 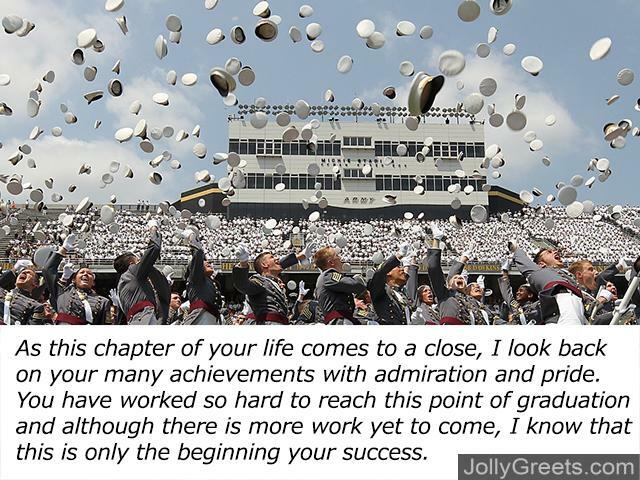 The perseverance and hard work that has led you to graduation will continue to bring you success in coming years. Looking beyond your many accomplishments, your humility and dedication are inspiring. Congrats! Getting that sought-after diploma is an incredible achievement, but I know that it is just the first of many great accomplishments for you. Bask in this moment, and be proud of all you have done. Congrats! At this monumental moment in your life, you look back on the many memories you made, the close friends you now know. Saying goodbye to high school can be bittersweet, but I assure you, what lies before you are endless possibilities. Congratulations, graduate! High school is a time of growing up, of learning, of discovering who you are and who you want to become. With your passion, dedication, and boundless energy, I know that there are remarkable things in your future. Wishing you the best in your post-high school career and, of course, congrats! To survive high school, you have to be persistent, hard-working, and dedicated. You are all those things and more–your passion and sense of humor inspire everyone around you. Congratulations, graduate, it’s time to bid farewell to high school and welcome the wonderful times to come. My beautiful daughter, you are now a graduate! I knew, without one doubt, that this day would come, but I didn’t realize how enormously proud I would feel. You have navigated the past years with strength and grace, becoming a beautiful, abundantly intelligent woman. Congratulations, I love you! Ever since you were a little girl, you have exuded strength, wit, and fierce individuality. Now, you are all grown up, but you continue to light up every room you’re in. Congratulations on your graduation, my lovely daughter, I am so proud. My outstanding daughter, you are truly one-of-a-kind. Watching you reach graduation and grow into a vibrant, exceptionally intelligent young woman has been a great joy. Congratulations, I love you! I feel so lucky to have watched you grow into the extraordinary woman you are today. Seeing how incredibly hard you worked to reach graduation was inspiring, and I know that you will continue to inspire me with your future endeavors. Congratulations, I love you! My dear son, I am so incredibly proud of you. Your dedication, hard work, and ambition are inspiring. Now you’re a graduate and your future couldn’t be brighter. Congratulations! Son, I couldn’t be prouder of you. You have persevered through the ups and downs of the past few years, emerging even stronger than you were before. 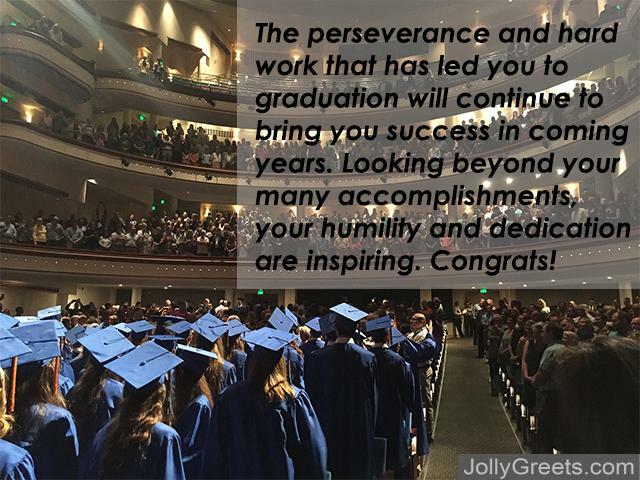 Congratulations, graduate, here’s to a bright, prosperous future! My remarkable son, you have worked so hard to get where you are today. 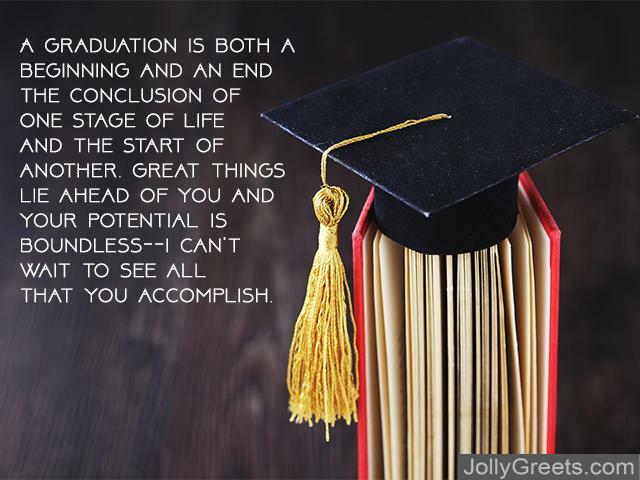 Reaching graduation is no small feat, and I know it took great effort and dedication to get there. Congratulations, I love you! Son, your graduation is an incredible achievement and I am so proud of you. You have truly come into your own, and I know there is greatness in your future. Congratulations, enjoy this moment, you have most certainly earned it. I wasn’t sure that I would make it, but here I am at graduation! I hope you can make it to this special event marking the conclusion of this chapter in my educational journey. See you there! My diploma is finally right within reach! Please share this special moment with me as I graduate alongside my peers. Graduation is finally here, and it would mean so much if you were there to watch me walk across the stage. You’re invited, I hope to see you there! You’re invited! My graduation is nearing and I would love for you to be there as I begin my next step in life. Graduation is a special time and I would be so happy if you were able to make it to mine. Watch me walk across the stage and get the diploma I have worked so hard for! See you there. I’m so excited to mark the completion of my high school education with a beautiful ceremony, and I hope you will join me! With one of the meaningful notes above, your loved one’s graduate will be an event to remember!